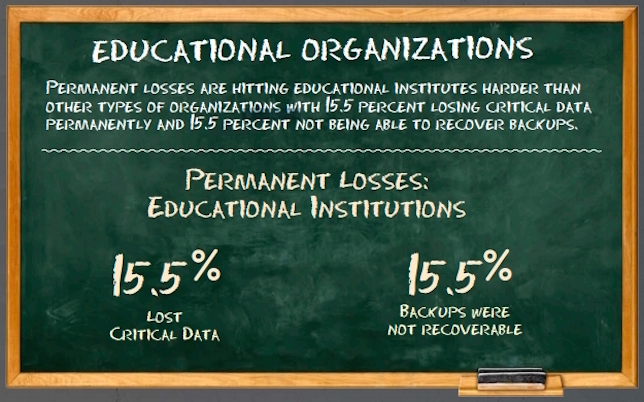 Compared to other kinds of organizations — business, government and not-for-profit — educational institutions are the least prepared for disaster recovery. Only a quarter consider themselves "very prepared" to recover from a disaster or incident. While a majority — 62 percent — have a disaster recovery or business continuity plan in place, that count is 74 percent across all entities. In fact, educational institutions fared far worse than other types when they experienced a disaster. Twenty-eight percent reported suffering permanent losses, and recovery took up staff time in four out of 10 cases. Nearly two-thirds (62.5 percent) took more than a single business day to recover from their emergency event. Those figures come out of a recent report from Evolve, a company that sells access to cloud-based services for IT operations, including virtual servers and desktops, unified communications and disaster recovery. The company did a blind Web-based survey among 2,084 individuals in December. The education segment consisted of respondents from both K-12 and higher education. Leading causes of disasters cited among the entire surveyed group were hardware outages (47 percent), environmental disasters (34 percent), power outages (27.5 percent) and human error (18.5 percent). Overall, the report found, education executives and IT professionals believe they lack the kind of budget they need to develop a really effective disaster recovery/business continuity plan. Slightly more than a quarter of education organizations locate their secondary data operations less than 25 miles from the main site, making it far more likely "that both sites would be impacted in the event of a major environmental disaster," the report's authors pointed out. That's true for only 16 percent of businesses. Almost a third of educational operations (31.5 percent) reported losing more than one day's worth of data during their "worst" incident. About half as many (15.5 percent) said they've lost "critical data" permanently and the same number said they were unable to recover backups. More than half (57.5 percent) consider their disaster recovery budgets underfunded. Forty-two percent said they were sufficiently funded, compared to 63 percent in for-profit companies. "For many organizations the question isn't 'if' they will suffer a disaster; it's 'when,'" said Evolve Chief Sales Officer Tim Allen. "When disaster hits, it hits hard, typically taking over a day to recover and causing financial as well as data losses."